The comeback fever is rampant among the Swiss women and it appears to be contagious. Martina Hingis is rolling back the years, adding doubles and mixed Grand Slam titles to her impressive resumé whereas Timea Bacsinszky has roared back into WTA Tour life; her impressive year has featured two titles and Roland Garros semifinal appearance. At the Tennis International in Darmstadt, Germany, Patty Schnyder’s first match in four years was one of the big talking points but there’s another — maybe less-heralded Swiss — who has picked up the racket again. After calling it quits 15 months ago, Amra Sadikovic has given her career a second chance. René Denfeld sat down with the 26-year-old during her fourth tournament back and talked perspective, conviction and inspiration by compatriots. “You know, the one player who looks like she’s ranked inside the Top50, both in terms of weapons and athleticism, has got to be Sadikovic,” one of the volunteers in Darmstadt expressed — just as the Swiss walked into the press area unbeknownst to him. A smile flashed across her face and a polite “thank you,” escaped her lips. Potential has always been a topic that accompanied Sadikovic throughout her career. The Macedonian-born Swiss woman brings a lot of the physical requisites of the modern game to the table — at 6’1, she is tall, moves deceptively well and possesses a good serve. With her comeback, however, comes the need to polish some things. Last April, Sadikovic called it quits on her career in professional tennis, but even before that she struggled with burnout in 2011 and 2012. A few days after her 25th birthday in 2014, the 8-time ITF title-winner announced her retirement from professional tennis with immediate effect, to the surprise of many in the Swiss tennis circle. “Most people really didn’t get it at all and for my family it was a bit of a shock,” Sadikovic said. “For me, it was really good because I kinda lost myself along the way a little. After playing the Swiss Championships in December, the Swiss’ fire for the game was reignited but in order to avoid another burnout — both physically and mentally — she approached her return carefully. The WTA is currently running the “Power To Inspire” campaign and in a way it wouldn’t be out of the realm of imaginary to say that Sadikovic might be powered by one of her successful compatriots who has set the tour ablaze this year. Sadikovic has never shied away from the grind and the hard work that comes with the life of a pro-athlete — but that final belief has eluded her in previous years. It’s only now that she is able to put the pieces together and see the bigger picture. Sadikovic is now working with Mohammed Fetov, a former Swiss pro. “It’s going really well because he pushes me, helps me go to the limit and it’s fun because he’s such a positive guy. That’s exactly what I need,” she said. Amra Sadikovic serves in Darmstadt. Photo: René Denfeld. The Swiss also hopes that the new-found confidence is going to translate into her game. Sadikovic’s serve is one of her weapons and her game around the net is impressive — both in terms of her reach but also her deft touch. After coming through qualifying — as she has in each of the four events of her comeback thus far — the returnee’s run in Darmstadt was stopped in the semifinals by Belgian No. 4 seed Ysaline Bonaventure, who was more solid on a very windy Saturday. 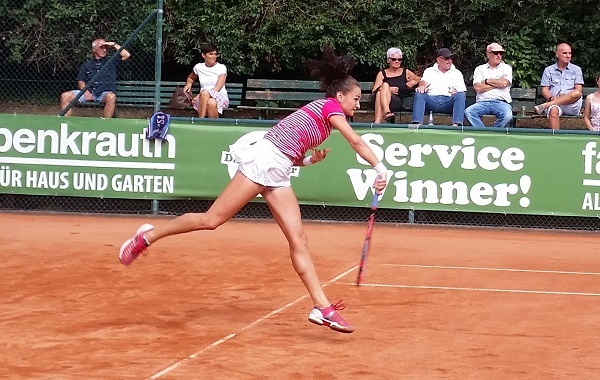 She’s already reached two semifinals and a quarterfinal in her return to the ITF Circuit — so what next for for the Swiss? Sadikovic might not have scored the coup some people thought she would in Darmstadt but overall her first few tournaments back have been a success. She’s already back inside the world’s Top 500, but with her rediscovered passion for the yellow balls and white painted lines, it seems unlikely that it’s going to stop there.